In his 1989 book, The New Organic Grower, Eliot Coleman says this about garden weeding: “Don’t weed, cultivate… Large weeds are competition for both the crops and the grower.” While continuous light cultivation to prevent weeds is very ideal, we don’t always stay on top of things in the never-ending weed game. Inevitably you’re going to get weeds sprouting between the rows in your vegetable garden. And when you do, you’re going to need an efficient means for eliminating them. We have two different garden weeding attachments for the Hoss Wheel Hoe – Sweeps and Oscillating Hoes. Our Sweeps are sold as a pair (left and right) and our Oscillating Hoes are available in three different blade sizes — 6″, 8″ and 12″. Although these Wheel Hoe Attachments have the same garden weeding function, they each have unique features that might make one or the other perfect for you. 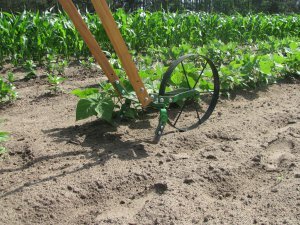 Our Sweeps attachment for the Hoss Wheel Hoes include a left and right weeding blade. These blades made of high carbon steel and are extremely sharp out of the box. The left and right blade have a slightly different angle, so that they can be overlapped without interfering with the other. This allows you to alter the weeding path when using the Sweeps. With the versatility afforded by the many attachment holes on Hoss Wheel Hoe tool bar, you can arrange the Sweeps for a solid garden weeding path as narrow as 6″ all the way up to 12″. 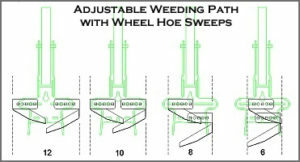 The Sweeps can also be configured for “straddle-weeding” with the Hoss Double Wheel Hoe. 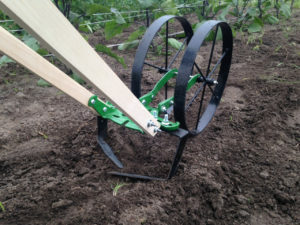 Because of the space between the wheels, you can configure the Sweeps blades to extend outward towards the wheels, leaving a space in the middle to straddle your vegetable plants. 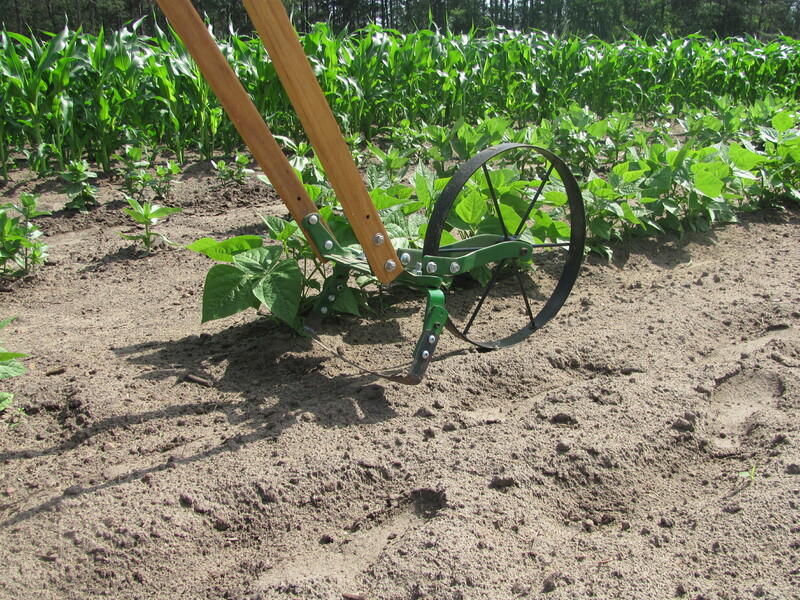 Our Oscillating Hoes (or stirrup hoes) are made with a powder coated steel frame and a sharpened, spring steel blade. Unlike the Sweeps, the Oscillating Hoe blades are sharp on both sides. This allows you to cut weeds while pushing the Wheel Hoe in a forward and backward motion down the row. As mentioned earlier, our Oscillating Hoes are a fixed width (6″, 8″ or 12″). The width that’s right for you will depend on your row spacing. With some crops like corn or beans with wider row spacing, you might choose the 12″ Oscillating Hoe. However, with crops like lettuce and greens that typically have narrower row spacing, the 6″ might be perfect. By selecting our Spreader Bar Bonus option, you can also perform “straddle-weeding” with the 6″ Oscillating Hoes attached to the Hoss Double Wheel Hoe. To conclude, the Sweeps offer a little more versatility as far as different weeding width configurations. And while the Oscillating Hoes are a fixed width, they are sharp on both sides which allows you to cut forwards and backwards. The choice for you will depend on your growing situation. You can’t go wrong with either option for garden weeding!